A provocative essay that places compassion at the heart of Christian life as a counterbalance and a challenge to a world governed far too long by principles of power and destructive control. In this provocative essay on that least understood virtue, compassion, the authors challenge themselves and us with these questions: Where do we place compassion in our lives? Is it enough to live a life in which we hurt one another as little as possible? Is our guiding ideal a life of maximum pleasure and minimum pain? Compassion answers no. After years of study and discussion among themselves, with other religious, and with men and women at the very center of national politics, the authors look at compassion with a vigorous new perspective. They place compassion at the heart of a Christian life in a world governed far too long by principles of power and destructive control. Compassion, no longer merely an eraser of human mistakes, is a force of prayer and action -- the expression of God's love for us and our love for God and one another. Compassion is a book that says no to a compassion of guilt and failure and yes to a compassionate love that pervades our spirit and moves us to action. 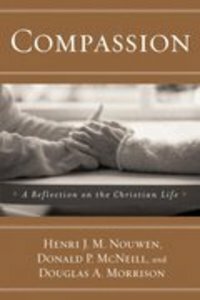 Henri Nouwen, Donald McNeill, and Douglas Morrison have written a moving document on what it means to be a Christian in a difficult time. The internationally renowned priest and author, respected professor and beloved pastor Henri Nouwen wrote over 40 books on the spiritual life. He corresponded regularly in English, Dutch, German, French and Spanish with hundreds of friends and reached out to thousands through his Eucharistic celebrations, lectures and retreats. Since his death in 1996, ever-increasing numbers of readers, writers, teachers and seekers have been guided by his literary legacy. Nouwen's books have sold over two million copies and been published in over 22 languages. His books include The Return Of The Prodigal Son, Here And Now: Living In The Spirit, In The Name Of Jesus: Reflections On Christian Leadership.- Publisher. God is a compassionate God. This means, first of all, that our God has chosen to be God-with-us. To be able to know and feel better this divine solidarity, let us explore the experience of someone being truly with us. These reflections offer only a glimpse of what we mean when we say that God is a God-with-us, a God who came to share our lives in solidarity. It does not mean that God solves our problems, shows us the way out of our confusion, or offers answers for our many questions. God might do all of that, but the solidarity of God consists in the fact that God is willing to enter with us into our problems, confusions, and questions. As soon as we call God, "God-with-us," we enter into a new relationship of intimacy. By calling God Immanuel, we recognize God's commitment to live in solidarity with us, to share our joys and pains, to defend and protect us, and to suffer all of life with us. The God-with-us is a close God, a God whom we call our refuge, our stronghold, our wisdom, and even, more intimately, our helper, our shepherd, our love. We will never really know God as a compassionate God if we do not understand with our heart and mind that "the Word became flesh and lived among us" (Jn 1:14) NRSV. Often we say to each other in a bitter tone: "You do not know what you are talking about because you did not march in protest, participate in the strike, or experience the hatred of the bystanders, because you were never hungry, never knew cold, or never felt real isolation." When we say such things, we express the deep conviction that we are willing to listen to consoling words only when they are born out of solidarity with the condition that was or is ours. God wants to know our condition fully and does not want to take away any pain which God has not fully tasted. God's compassion is anchored in the most intimate solidarity, a solidarity that allows us to say with the psalmist, "This is our God, and we are the people he pastures, the flock that he guides" (Ps 95:7). We know this because in Jesus, God's compassion became visible to us. Jesus not only said, "Be compassionate as your Father is compassionate," but Jesus also was the concrete embodiment of this divine compassion in our world. Jesus' response to the ignorant, the hungry, the blind, the lepers, the widows, and all those who came to him with their suffering, flowed from the divine compassion which led God to become one of us. We need to pay close attention to Jesus' words and actions if we are to gain insight into the mystery of this divine compassion. We would misunderstand the many miraculous stories in the Gospels if we were to be impressed simply by the fact that sick and tormented people were suddenly liberated from their pains. If this were indeed the central event of these stories, a cynic might rightly remark that most people during Jesus' day were not cured and that those who were cured only made it worse for those who were not. What is important here is not the cure of the sick, but the deep compassion that moved Jesus to these cures. There is a beautiful expression in the Gospels that appears only twelve times and is used exclusively in reference to Jesus or the Father. That expression is "to be moved with compassion." The Greek verb splangchnizomai reveals to us the deep and powerful meaning of this expression. The splangchna are the entrails of the body, or as we might say today, the guts. They are the place where our most intimate and intense emotions are located. They are the center from which both passionate love and passionate hate grow. When the Gospels speak about Jesus' compassion as his being moved in the entrails, they are expressing something very deep and mysterious. The compassion that Jesus felt was obviously quite different from superficial or passing feelings of sorrow or sympathy. Rather, it extended to the most vulnerable part of Jesus' being. It is related to the Hebrew word for compassion, rachamim, which refers to the womb of Yahweh. Indeed, compassion is such a deep, central, and powerful emotion in Jesus that it can only be described as a movement of the womb of God. There, all the divine tenderness and gentleness lies hidden. There, God is father and mother, brother and sister, son and daughter. There, all feelings, emotions, and passions are one in divine love. When Jesus was moved to compassion, the source of all life trembled, the ground of all love burst open, and the abyss of God's immense, inexhaustible, and unfathomable tenderness revealed itself. This is the mystery of God's compassion as it becomes visible in the healing stories of the New Testament. When Jesus saw the crowd harassed and dejected like sheep without a shepherd, he felt with them in the center of his being (Mt 9:36). When Jesus saw the blind, the paralyzed, and the deaf being brought to him from all directions, he trembled from within and experienced their pains in his own heart (Mt 14:14). When he noticed that the thousands who had followed him for days were tired and hungry, Jesus said, I am moved with compassion (Mk 8:2). And so it was with the two blind men who called after him (Mt 9:27), the leper who fell to his knees in front of him (Mk 1:41), and the widow of Nain who was burying her only son (Lk 7:13). They moved Jesus, they made him feel with all his intimate sensibilities the depth of their sorrow. He became lost with the lost, hungry with the hungry, and sick with the sick. In Jesus, all suffering was sensed with a perfect sensitivity. The great mystery revealed to us in this is that Jesus, who is the sinless son of God, chose in total freedom to suffer fully our pains and thus to let us discover the true nature of our own passions. In him, we see and experience the persons we truly are. Jesus who is divine lives our broken humanity not as a curse (Gn 3:14-19), but as a blessing. His divine compassion makes it possible for us to face our sinful selves, because it transforms our broken human condition from a cause of despair into a source of hope. This is what we mean when we say that Jesus Christ reveals God's solidarity with us. In and through Jesus Christ we know that God is our God, a God who has experienced our brokenness, who has become sin for us (2 Co 5:21). God has embraced everything human with infinite tenderness and compassion. But what about the cures? Did not the blind see, the lepers become pure, the paralyzed walk again, and the widow see her son come back to life? Is that not what counts? Is that not what proves that God is God and he really loves us? Let us be very careful with our pragmatism. It was out of his compassion that Jesus' healing emerged. He did not cure to prove, to impress, or to convince. His cures were the natural expression of his being our God. The mystery of God's love is not that our pain is taken away, but that God first wants to share that pain with us. Out of this divine solidarity comes new life. Jesus' being moved in the center of his being by human pain is indeed a movement toward new life. God is our God, the God of the living. In the divine womb of God, life is always born again. The great mystery is not the cures, but the infinite compassion which is their source. We know too well what it means when cures are performed without compassion. We have seen men and women who can walk again, see again, speak again, but whose hearts remain dark and bitter. We know too well that cures not born out of care are false cures leading not to light but to darkness. Let us not fool ourselves with a shortcut to new life. The many cures by Jesus recorded in the Gospels can never be separated from his being with us. They witness to the infinite fecundity of Jesus' divine compassion, and show us the beautiful fruits of his solidarity with our condition. The truly good news is that God is not a distant God, a God to be feared and avoided, a God of revenge, but a God who is moved by our pains and participates in the fullness of the human struggle. The miraculous cures in the Gospels are hopeful and joyful reminders of this good news, which is our true consolation and comfort. When we take a critical look at ourselves, we have to recognize that competition, not compassion, is our main motivation in life. We find ourselves deeply immersed in all sorts of competition. Our whole sense of self is dependent upon the way we compare ourselves with others and upon the differences we can identify. When the question "Who am I?" is put to the powers of this world--school officials, church representatives, placement officers, athletic directors, factory managers, television and radio announcers--the answer is simply, "You are the difference you make." It is by our differences, distinctions, that we are recognized, honored, rejected, or despised. Whether we are more or less intelligent, practical, strong, fast, handy, or handsome depends upon those with whom we are compared or those with whom we compete. It is upon these positive or negative distinctions that much of our self-esteem depends. It does not take much reflection to realize that in all family problems, race conflicts, class confrontations, and national or international disputes, these real or imaginary distinctions play a central role. Indeed, we invest much of our energy in defending the differences between people and groups of people. Thus, we define ourselves in ways that require us to maintain distance from one another. We are very protective of our "trophies." After all, who are we if we cannot proudly point to something special that sets us apart from others? The compassion Jesus offers challenges us to give up our fearful clinging and to enter with him into God's fearless life. In saying be compassionate as your loving God is compassionate, Jesus invites us to be as close to each other as God is to us. He even asks us to love one another with God's own compassion. A divine compassion is a compassion without the slightest tinge of competition. Therefore, only God can be wholly compassionate because only God is not in competition with us. The paradox of God's compassion is that God can be compassionate because God is wholly other than we are. Because God is wholly other, God can become wholly as we are. God can become so deeply human because God is so fully divine. In short, God can be fully compassionate because there can be no comparison with us and thus God is in no way in competition with us. Jesus' command be compassionate as your loving God is compassionate is a command to participate in the compassion of our Creator God. Jesus requires us to unmask the illusion of our competitive selfhood, to give up clinging to our imaginary distinctions as sources of identity, and to be taken up completely into intimacy with God. This is the mystery of the Christian life: to receive a new self, a new identity, which depends not on what we can achieve, but on what we are willing to receive. This new self is our participation in the divine life in and through Christ. Jesus wants us to belong to God as he belongs to God; he wants us to be children of God as he is a child of God; he wants us to let go of the old life, which is so full of fears and doubts, and to receive the new life, the life of God. In and through Christ we receive a new identity that enables us to say, "I am not the esteem I can collect through competition, but the love I have freely received from God." It allows us to say with Paul, "I live now not with my own life but with the life of Christ who lives in me" (Ga 2:20).